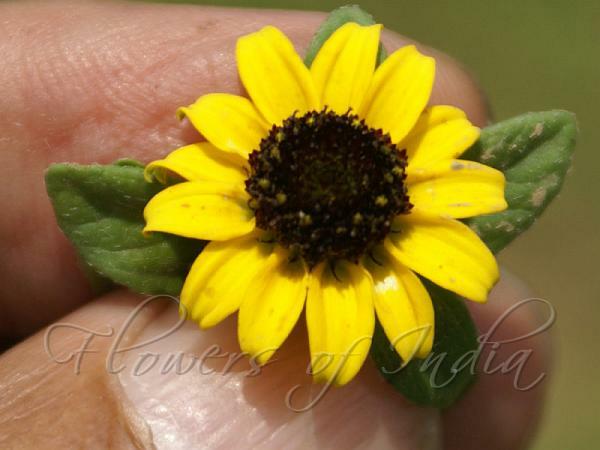 Creeping zinnia is a mat-forming annual that typically grows to 6 inches tall but spreads by creeping stems to 12-18 inches wide or more.Blooms with 1.8-2 cm across miniature sunflower-like flowers with yellow to orange-yellow rays and dark purplish-brown center disks. Varieties come in single- and double-flowered forms. Creeping stems are clad with oval, medium green, zinnia-like leaves (up to 2 inches long), hence the common name. 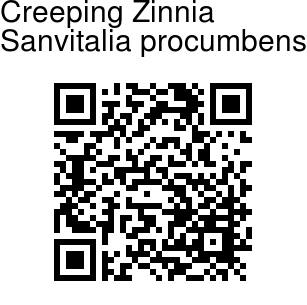 Creeping Zinnia is native to Mexico, Guatemala. Photographed in Botanical Garden below Chashme Shahi, Kashmir.